I hope that Chaya of Sweet & Savory will forgive me, but I bent the rules this week and strayed a bit from the selected recipe. I still made Orange Blueberry Muffins topped with Pecan Crumble, but my muffin base is not exactly from The Sweet Melissa Baking Book. Even though I made them over 9 months ago, the “sister” muffins to this week’s recipe, which featured peaches instead of blueberries, were markedly dense, heavy, and overall unimpressive. Though many of our highly creative and supremely talented bakers offered valuable suggestions to address the muffins’ textural inadequacies, I felt they were sadly beyond saving. 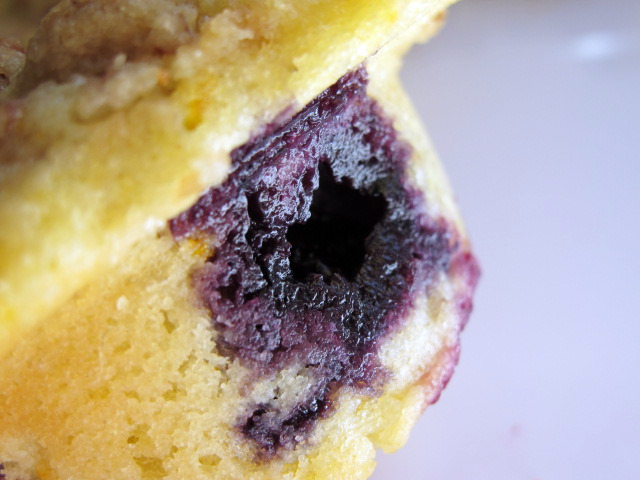 😦 And, it just so happens that I’ve been waiting for the perfect opportunity to try my beloved Cook’s Illustrated’s new version of Blueberry Muffins, which utilizes a unique method of injecting major fruity flavor. I figured if I honored the required orange-blueberry combination, and still topped my muffins with Sweet Melissa’s Pecan Crumble, I could keep my recently renewed participation in SMS going, and maybe offer an alternative to those who remained unsatisfied with the recipe as written. Berry baked goods are typically banned from my household, with my MVT (Most Valuable Taster), my Mom, severely allergic. But, as it happens, my Dad LOVES a good berry studded muffin- and what kind of daughter would I be to deprive him of such an indulgence every once in a blue moon (no pun intended!)? While I hated the thought of making something my mom couldn’t also enjoy, in this particular instance, I decided it was for the greater good of SMS (and my Daddy’s belly). Not to worry though, coming up soon is a Coconut Custard Pie that has my Mom’s name written all over it! But first, on to the muffins! I think I may have hit the blueberry muffin mother-load with this one. Break into one of these little gems, and you’ll quickly discover they are not only jam packed and bursting with bright berry goodness, but also have an incredibly moist interior, and a soft, delicate, tender crumb. 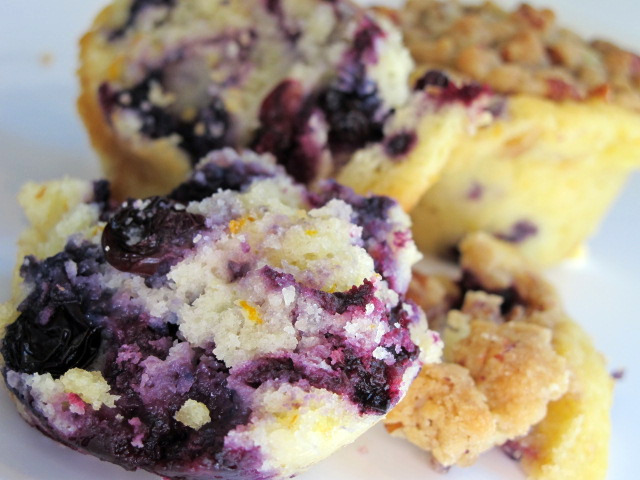 Beautifully balanced with the subtle citrus undertones of orange zest (a fun, unexpected spin on the classic blueberry-lemon combo), and crowned with a sweet, crunchy, nut-filled streusel topping, the ideal textural foil for what awaits inside; they are a truly a muffin lover’s dream. While my Dad is not nearly as prolific or expressive with his reviews as my Mom, he was surely not at a loss for compliments when it came to these breakfast beauties. If they pass the Daddy deliciousness test, they will definitely have a permanent home in my recipe files. One of my favorite features of a Cook’s Illustrated recipe, is the inclusion of a detailed history describing how it was conceived. 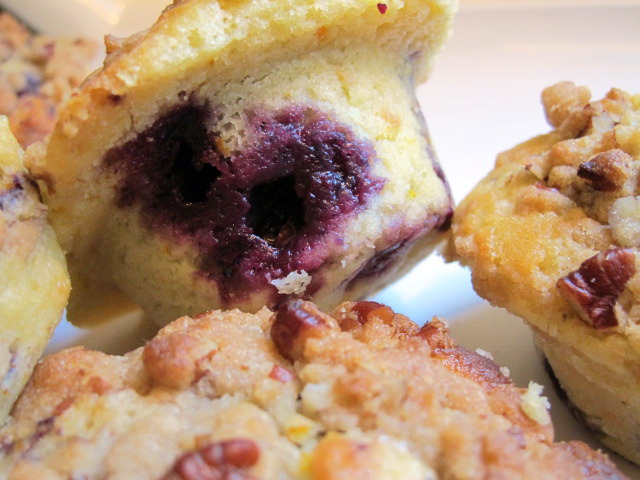 In the process of constructing the “Best” blueberry muffin, CI tested a variety of ways to achieve maximum intensity of sweet-tart fruity flavor. Ulimately, they landed on a technique that I think is absolutely brilliant: to pump up the volume, why not take some of the berries, cook them down on the stovetop to evaporate excess juices, thus concentrating their flavor, and swirl the resulting mixture right into the muffin batter? As it turns out, this thick, potent, deep-indigo jam, swirled in along with a substantial amount of fresh fruit, gave the muffins a distinctive one-two berry punch- exactly what they needed to put them over-the-top. But what about the muffin base- after all, that was the problem I was dealing with in the first place… what did Cook’s do to ensure I didn’t fall into the same trap I had with Melissa’s? Well, those clever folks at CI had a few tricks up their sleeves (and some interesting science to back them up)! First off, they examined the mixing method: the creaming method was out after producing muffins that were too cake-like, and unable to support the hefty amount of fruit added to the batter. A more suitable choice, was the quick-bread or “muffin method” (haha! big surprise there!) that calls for mixing the wet and the dry ingredients separately, and then gently folding them together. 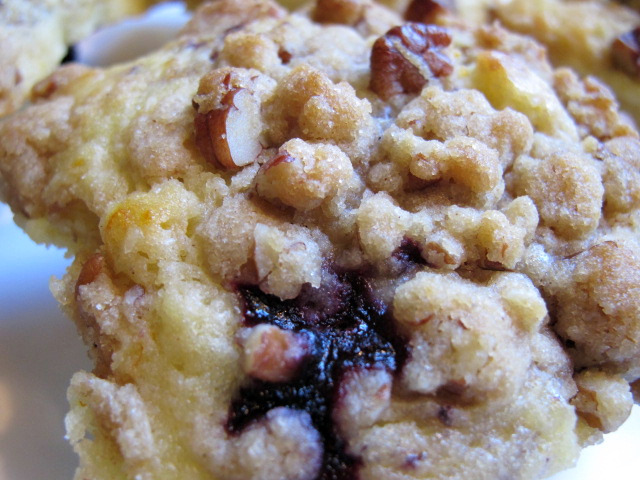 They stressed the importance of not over-mixing (as with pancake batter), because “overly strenuous mixing encourages the proteins in flour to cross-link and form gluten, toughening the final product.” This method proved superior, and made for muffins with a hearty crumb, substantial enough to support the generous addition of berries. Next, to achieve ultimate moisture, they considered the fat used in the recipe. The balance of butter (which contributes great flavor) and oil (more effective at making baked goods moist and tender) was the key. Apparently, “unlike butter, oil contains no water, and is able to completely coat flour proteins and prevent them from absorbing liquid to develop gluten.” Equal amounts of both fats ended up producing just the right combo of buttery flavor, and moist, tender texture. Finally, to make the muffins as rich as possible, they sought a substitute for whole milk. Buttermilk offered a slight tang (complementing the berries) and appealing richness, while still being light enough “to keep the muffins from turning into heavyweights.” And do we want heavyweights, my friends? I think not! In my eyes, they successfully deduced a winning recipe for not only blueberry muffins, but “fill-in-the-blank” muffins, that would be delicious with any selection of mix-ins. No more futzing with Melissa’s metzah-metzah muffins (that means so-so for all you non Yiddush speakers out there). These babies are where it’s at! Thank you Chaya for hosting this week- and again, please let me apologize for taking such extreme creative liberties with the recipe. I also wanted to extend a very warm welcome your way- SMS is lucky to have you and I’m looking forward to baking together each week! To check out all the other SMSter’s muffins, swing by our blogroll– can’t wait to hear from all you lovely ladies! 1. FOR THE MUFFINS: Adjust oven rack to upper-middle position and heat oven to 425 degrees. Spray standard muffin tin with nonstick cooking spray. Bring 1 cup blueberries and 1 teaspoon sugar to simmer in small saucepan over medium heat. Cook, mashing berries with spoon several times and stirring frequently, until berries have broken down and mixture is thickened and reduced to ¼ cup, about 6 minutes. Transfer to small bowl and cool to room temperature, 10 to 15 minutes. 3. Use an ice cream scoop or large spoon to divide batter equally among prepared muffin cups (CI suggests that the “batter should completely fill cups and mound slightly,” however, that left me with a little overflow problem, i.e. merging muffin tops. I was worried that my muffins would be unattractive, but once split apart, they really looked fine. Next time though, I’ll only fill the cups 3/4 of the way, and make a few extra!). Spoon a teaspoon of cooked berry mixture into center of each mound of batter (I stuck my spoon down in a ways just to be sure the blueberry mixture went through and through). Using a chopstick or skewer, gently swirl berry filling into batter using a figure-eight motion. 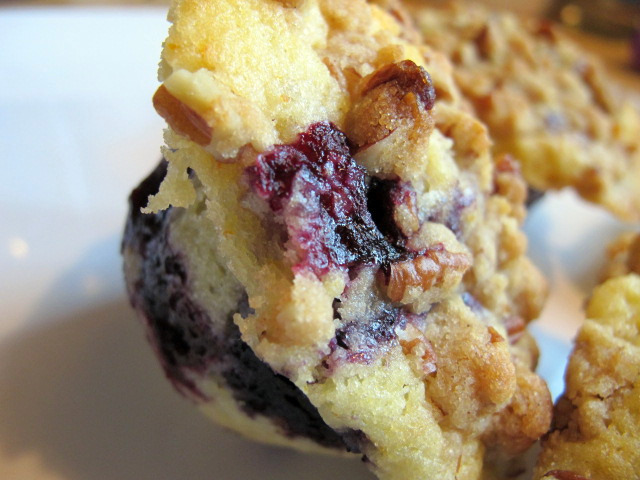 (If using: Sprinkle pecan crumble- recipe below- generously and evenly over muffins). 4. Bake until muffin tops are golden and just firm, 17 to 19 minutes, rotating muffin tin from front to back halfway through baking time. (My gigantic muffins took significantly longer to pass the toothpick test, at least an additional 3-4 minutes, but if they were normal size, the baking time given would probably be accurate). 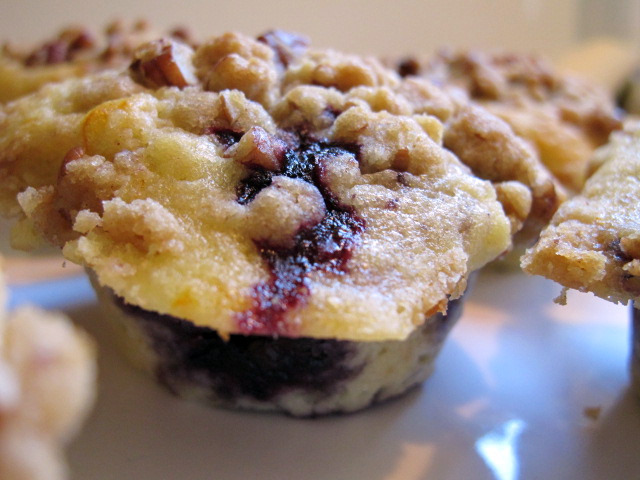 Cool muffins in muffin tin for 5 minutes, then transfer to a wire rack and cool 5 minutes before serving. Note: Our preferred brands of frozen blueberries are Wyman’s and Cascadian Farm. 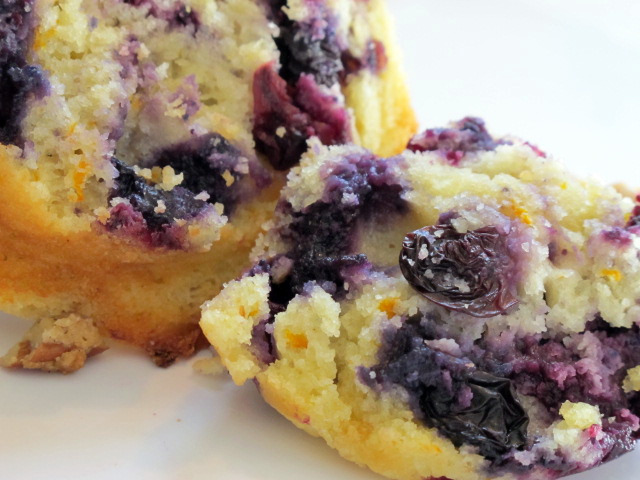 Follow recipe for Best Blueberry Muffins, substituting 2 cups frozen berries for fresh. Cook 1 cup berries as directed in step 1. Rinse remaining cup berries under cold water and dry well. In step 2, toss dried berries in flour mixture before adding egg mixture. Proceed with recipe from step 3 as directed. Cook half of fresh blueberries into thick jam to concentrate their flavor and eliminate excess moisture. Stir 1 cup of fresh blueberries into batter to provide juicy bursts in every bite. Place 1 teaspoon of cooled berry jam in center of each batter-filled cup, pushing it below surface. Using chopstick or skewer, swirl jam to spread berry flavor throughout. Makes enough for two batches of muffins (Either cut the recipe in half or use the extra in a baked fruit crumble!) I wonder if you can freeze the leftover- thoughts anyone? I’d advise you prepare this first, and have it ready to go when your muffins are portioned. 1. In a large bowl, stir together the pecans, flour, brown sugar, salt, nutmeg, allspice, *and cinnamon. Stir in the melted butter. Those muffins look great Joy! That is an amazing post..how do you find time to do that!? I love all the info. on proper technique and ingredients for the muffins. I made the SMS muffins twice and both times they were way to cakey and heavy. Your muffins look incredible! Im going to try your recipe..thank you! I’m drooling at my desk currently reading this post. I adore blueberry muffins! I am totally going to try the techinique of cooking the berries first 🙂 What a great idea! WOW. The muffins look amazing. I love the idea of boiling some down to concentrate the flavor. I wonder if it would work with any fruit. I guess I’ll have to try it during the summer. “3. How do I tell if the pie is done? The most common way is to insert a thin knife blade near the center. If the blade comes out clean, the pie is done. Gives me an idea for what to do with all the strawberries (fresh, frozen, jarred and canned) that I seem to have been accumulating. I’ve beenon a sub-conscious strawberry binge! Sounds like you solved the heavy-dry issue that we all had with the recipe, and you almost have me wanting to go to the kitchen to try these again. Your muffins look delicious! This is an absolutely wonderful post! Love the details. I saw the episode on tv and it was very informative. In regards to the coconut pie, I’ve never made it. But, when I have questions, I go to the internet for answers. Sometimes you’ll find the answers you need. So, type in your question and see what comes up! Thank you for your sweet comments about my challah! Your muffins look amazing and I am looking forward to trying the recipe you used! These look absolutely fantastic. Thanks for including the recipe. 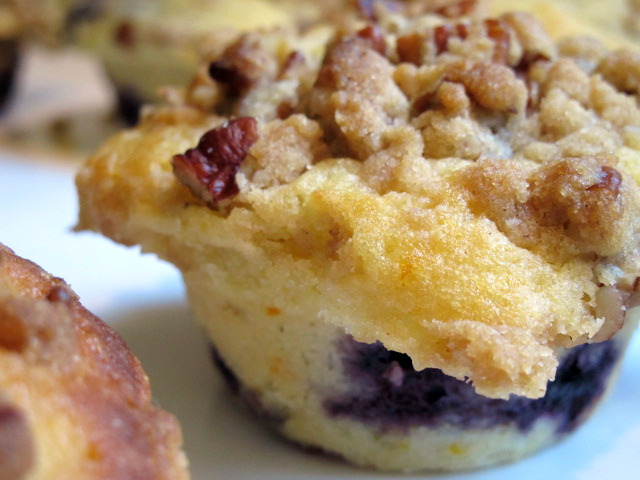 Muffins are a big favorite around here and i’m always looking for a more moist muffin. And the blueberries look delicious. Can’t wait until I can go pick my own at our local farm! Amazing muffins!! I doctored up the recipe and was very happy with the results, but I remember seeing this in CI and now I want to go back and make these muffins! Thanks for the compliments on my bliog about my lemon meringue pie- I appreciate it! On to the questions on my blog. Dig out that torch! I got mine from Home Depot and I was afraid to use it too. Mostly afraid of turning it on and blowing up the house- haha! But my husband showed me how to work it and I promptly snatched it out of his hands. It’s so much fun! How to halve egg whites…If the recipe calls for 5 eggs whites (as this months CSB cake does) then you’ll only need 2 1/2 for the recipe. I put two egg white in a bowl then put the 3rd egg white into a smaller bowl and whisked it up. THen I just used half of that amount. It’s probably not exact but it’s not enough to make a difference. I just throw the rest into my scrambled eggs. Does that make sense? Good luck with your cake/cupcakes! And thanks for sharing the Cook’s recipe for muffins! As you know I can’t comment on the taste of your muffins, but I can tell you that not much makes me want to take the risk of eating what will give me an allergic reaction, and these surely did. They looked incredible, and did get rave reviews from those who were able to taste them. Great job on making those adjustments in the recipie. I can’t wait to try the coconut custard pie, anything cococut is sure to be yummm!! By the way, I love the title of MVT. It makes me really happy to know that you value my opinion so much. Thanks for your kind comments! Look forward to your post this Sunday on SMS. These look incredible Joy. I especially love how rustic they look with the crumble on top. Your muffins look delicious! I love the CI step of cooking down some of the blueberries. I’ll have to give these a try. Great blog post! Not sure how I missed your post last week but glad I finally made it over here! Cook’s Illustrated recipes are some of my favorites – they’re almost always successful and I too love that they give so much detail about how they arrived at the final recipe. These blueberry muffins sound amazing so they’ll definitely be added to my list for the summer when fresh berries are abundant! Wish I could offer some advice for the pie. I make minis all the time but I can’t recall having ever made a mini custard pie. I’ll probably make a mini when the recipe comes up so if I get around to make it early I’ll let you know how it goes. Hi Joy! These look wonderful! I didn’t get to bake the blueberry muffins with everyone else, but these make me want to take a crack at it. You take wonderful pictures! I just saw your comment on my 5/10 post. That is very sweet of you to reach out, but I wouldn’t expect anything less from you. I really appreciate it. Cooking has become one of my coping strategies (as is evidenced by all the posts I have making lately-lol). We are taking it one day at a time and finding joy that our little girl is watching over us in heaven. Your muffins turned out great. Love that you combined them with the SMS topping! I remember seeing that CI recipe and wondering if cooking/mashing the berries would turn the batter completely purple. It doesn’t appear to have done that, so I’ll definitely have to give these a try. As for the ABC of the Month baking project, it’s not exclusive. Anybody can join, as long as they own or have easy access to Flo Braker’s book, Baking for all Occasions. Please let me know if you’d like to join us. Next month’s recipe is a fun one (it’s a yeast dough recipe).